Costa Rica is known for offering quality coffee, comparable to the best worldwide. However, 90% of the local production is destined for export and only 10% is for internal consumption. 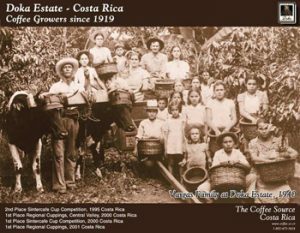 Since 1940 the Vargas family is dedicated to growing coffee. At the beginning their efforts were centered on this activity, by years later they begin to make incursions into the later phases of this process. First, the humid factory, then they go into the drying phase of the coffee, introducing new technologies; and last, they enter into the international market by exporting the golden bean, a process in which Tres Generaciones has more than 50 years of experience. During the decade of the eighties and at the beginning of the nineties, the company offers 100% pure roasted coffee to supply the daily use of the group Beneficiadora Santa Eduviges S.A. Later they extend sales among their administrative employees and the staff in charge of the plantations. In 1997 the project Café Tres Generaciones cafeterias is started; at this time the company finds itself needing to buy roasting and grinding machines, as well as bags for packing the product; some of plastic covered paper and others with regulating valves for the expulsion of gasses, in order to preserve the freshness of the product and to supply the demand at the points of sale. At present the business has a roasting plant that operates under the requirements of the General Law of Health, besides the requirements of the necessary safety to carry out the roasting and packaging processes. The creation of the electronic page www.dokaestate.com was the means through which Tres Generaciones S.A. made its incursion into the direct sale of coffee, ground and in whole grain, to foreign markets. According to the sales records of Café Tres Granos through this electronic means, these represented for 2004 20% of the totality of coffee leaving the roasting plant. Also the number of purchase orders placed on the Internet went up in the last three years; the above proves the project’s capacity for growth.